2pm - Evangeline and Gabriel. For all ages: Storytelling, arts & crafts, Acadian history. Traditional dress encouraged. Costumes available on site. Free admission. 9:30am - 12pm – Track and Field – at the L’Ardoise Parish Grounds - Activities include: races, high jump, long jump and softball throw. Awards, hotdogs and drinks to follow on church grounds. Free admission. 2 PM - The L'Ardoise Acadian Festival Outdoor Cemetery Mass held at the Holy Guardian Angel Parish Cemetery. 6pm - Crab Fest – at the L’Ardoise Acadian Festival at the L'Ardoise Community Centre. Come and enjoy a delicious crab dinner with musical entertainment. Admission: $12.00. Sponsored by Lobsters 'R' Us. The Festival’s Lob Ball Tournament starts at 6 PM at the L'Ardoise Ball field in L’Ardoise. 8:30pm – 11:30pm - Musical Entertainment for The L'Ardoise Acadian Festival will take place at the L'Ardoise Community Centre. Admission: $10. Music by Kenny Petitpas. 19 years of age and older. 7am - 10am - L'Ardoise Acadian Festival Breakfast held at the L'Ardoise Community Centre. Admission is adults $8.00 and children under 11 years of age $4.00. Lob Ball tournament continues at 8am. 10am - there will be a Children's Parade - doll carriages, bikes etc. takes place at the L'Ardoise Clinic Parking Lot. 11am - Acadian Baking at the Jolly Club in L'Ardoise. 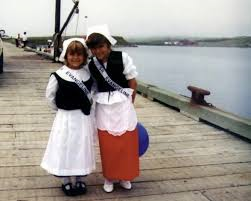 Free admission, children of all ages are invited to participate in baking an Acadian Cup Cake. 12:30pm - Blessing of the fleet, at the Chapel Cove Wharf. 2pm - A Merchandise and Lobster Bingo held at the L'Ardoise Community Centre. 4pm take in a Acadian Meat Pie and Seafood Chowder Supper held at the L'Ardoise Community Centre, admission is $10.00. 6:30pm – Enjoy a Music Recital at the Holy guardian Angels Church. 7pm – Acadian Festival Mass at the Holy guardian Angels Church. 9pm – Take in the Acadian Festival Dance at the L’Ardoise Community Centre with music by Back Around. Admission is $10.00 per person. 8am – Lob Ball Tournament Continues. 8am – 5klm Fun Run, walk or crawl takes place at the L’Ardoise Community Centre grounds. Donation is an item for the food bank. 11am – 1pm - A delicious Turkey Dinner at the L’Ardoise Community Centre. 4pm – Bounce A Rama and Klusky the Clown at the Parish grounds. 2pm to 4pm – Outside Entertainment at the Festival Grounds. 2pm – 6pm – live entertainment on the deck of the Community Centre. Cash Bar available. Must be 19 years to attend. 2pm – Festival of Floats.